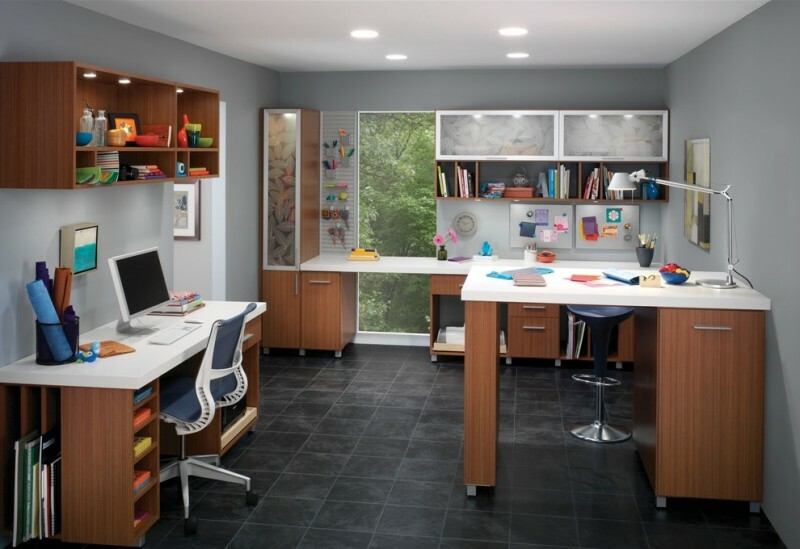 A craft desk is a valuable furniture piece for creative people and children. You can arrange it in your home office or craft room. 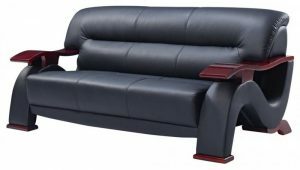 You can also place it in your bedroom if your bedroom still has spare space. A craft desk with storage can help you a lot in keeping your stuff. It provides enough storage space without removing the use of a craft desk. It may be a small desk or big depending on the available space. 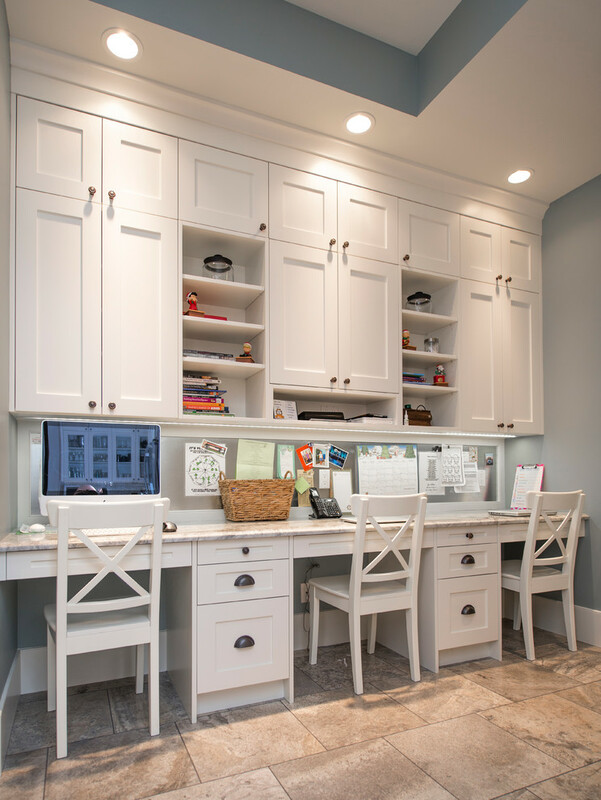 Here are some craft desks with storage ideas that you can get to complete your craft room or home office. The storage compartment in this desk is unique. These sturdy metal storage bins also act as a desk leg beneath this reclaimed wood desk. The open bins beneath this desk are easier to access than the closed drawers. You can keep arts and crafts supplies here. This desk has a perfect size for a child’s room. It is very affordable. This compact space features a built-in desk with storage, built-in shelves, gold wall sconces, and a wooden chair. 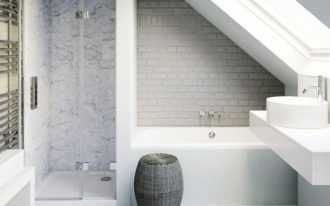 To add some colors to this white space, you can apply colorful wallpaper ad blackboard wallpaper on the wall. 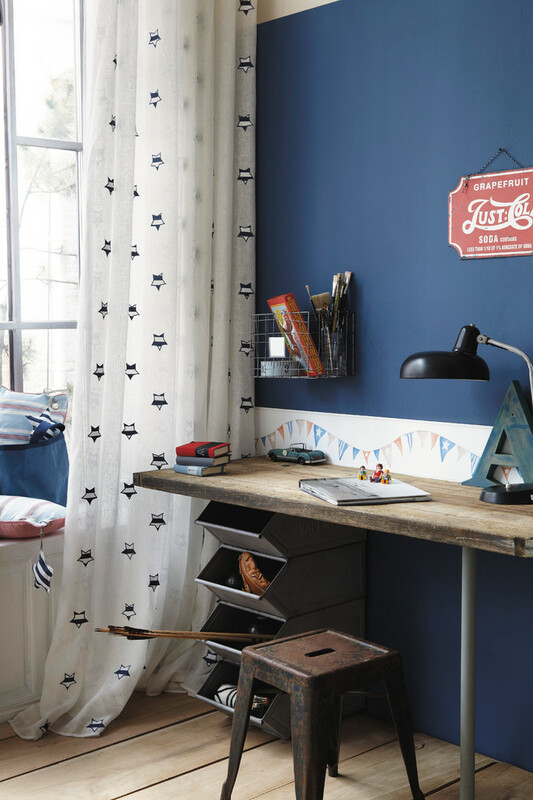 This tall craft desk with storage is placed near the big built-in shelves. The desk itself also has some open shelves. The open shelves are great for an easy access. On the other side of this white desk, there are some drawers for more storage spaces. 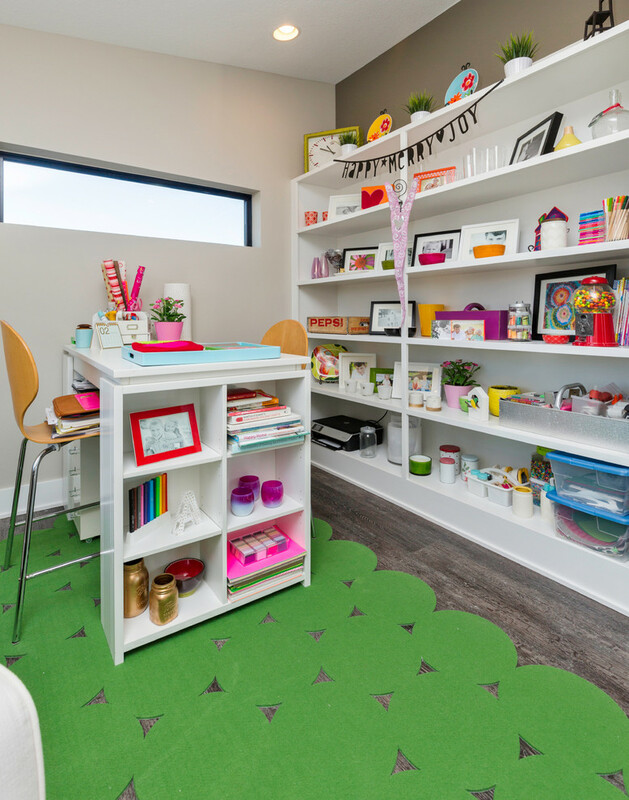 If you have friends who like making some crafts or studying with you, this workspace is the answer. it has a wide built-in desk with drawers. 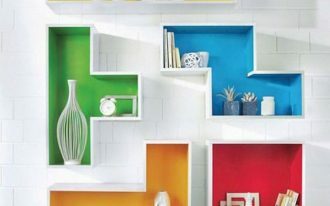 On the above, you can see there is wall mounted top cabinet with shelves. This craft room provides many storages. 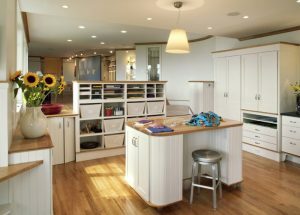 It also has multiple workspaces for different tasks with white countertop. 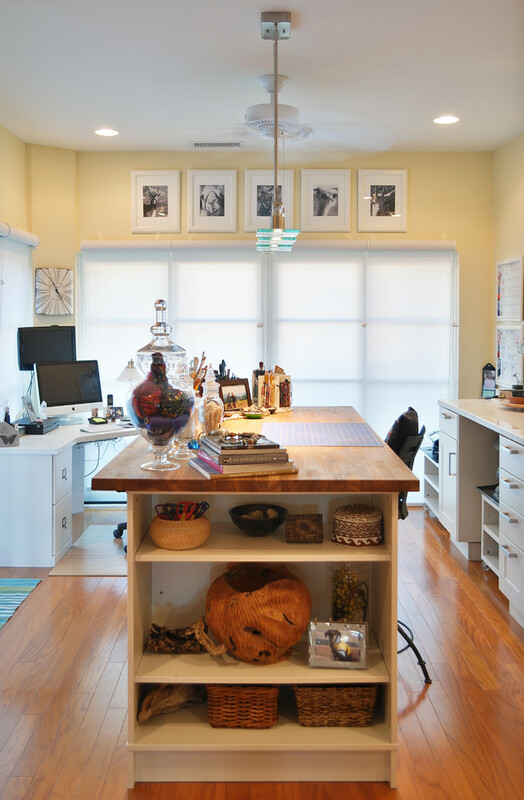 The craft table has spacious storage, barstool, and a white table lamp. 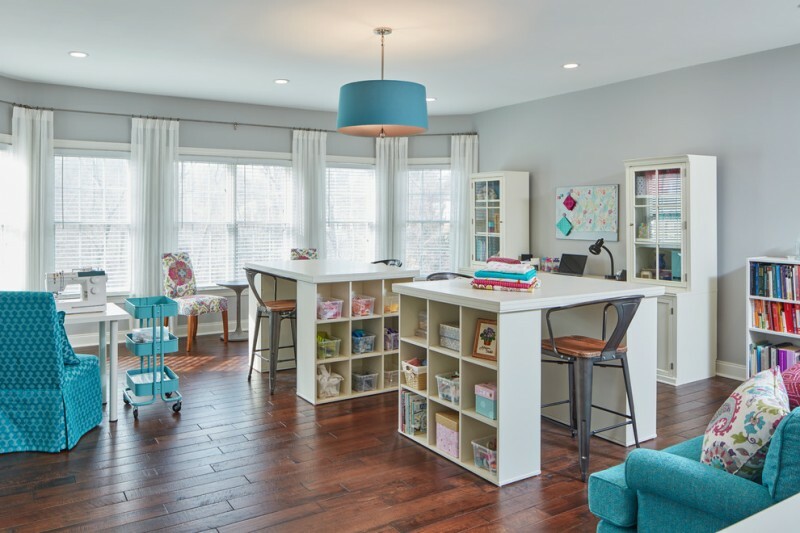 This room has two craft desks with shelves on both sides and barstools. The room also gets blue accents from the lighting, chairs, and mobilized rack. 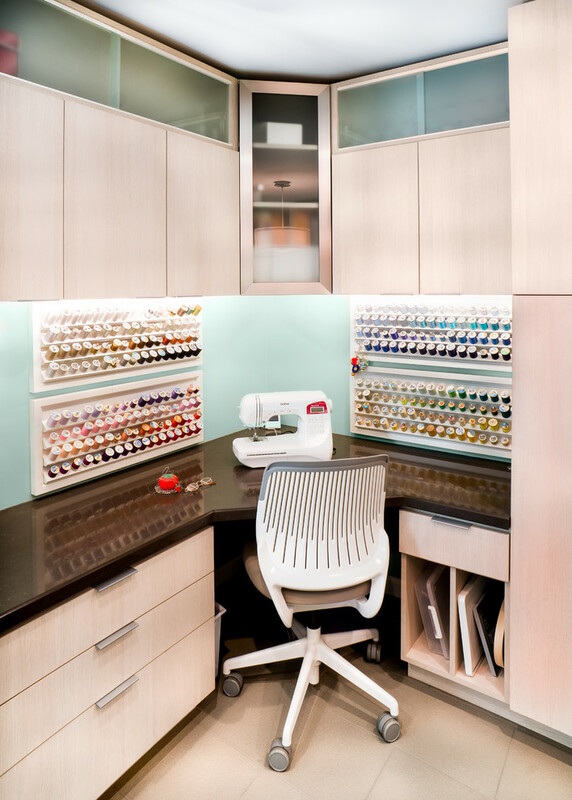 This trendy craft room has a built-in desk with many storages. A colorful artwork is placed on the wall in front of shewing space to decorate this room. This tread caddy is from Martha Stewart collection. 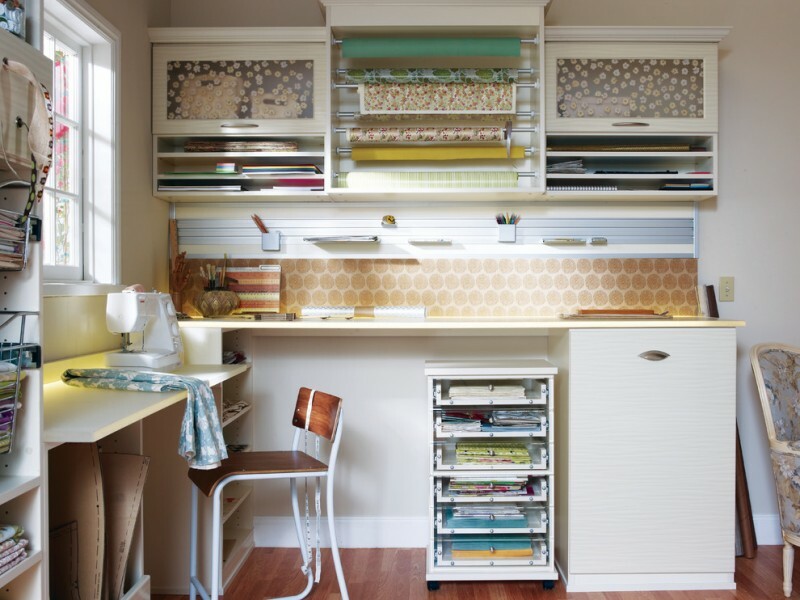 This corner craft space also offers many storage spaces especially the bobbin storage. 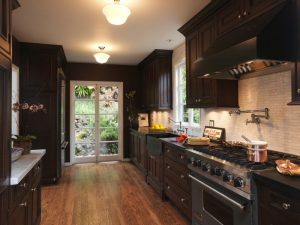 The blue wall and recessed lighting under the top cabinet have brightened this space. 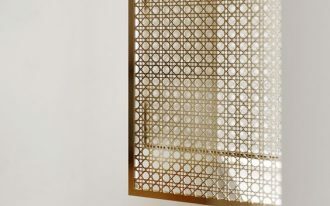 The windows that look like lightbox can stimulate the outdoor light. 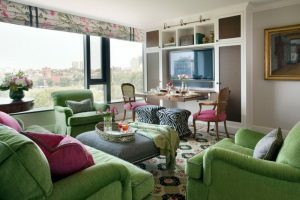 The furniture pieces in this room including the craft desk with storage are portable and can be moved more easily. This room features a desk with storage under the window, rolling cart of drawers, metal brackets against the wall, and top cabinet with wide short shelves for papers. The top cabinet also has closed storage with glass doors.